Refreshing, sweet, and incredibly delicious, this tropical mojito-inspired smoothie is sure to please! The combination of mango, barley grass juice powder, lime juice and the other ingredients makes for a liver-loving and cleansing smoothie that will also nourish your adrenals and give you energy. Enjoy this smoothie for breakfast, as a light lunch, or for an easy snack between meals. Barley grass juice powder: Contains phytonutrients that feed an undernourished liver while allowing it to detoxify dozens of toxins and poisons inherited from the past and exposed to in the present moment. It’s a responsible detoxifier with take-and-give integrity, replacing the troublemakers it removes with vital nutrients. Mangoes: Cool a toxic, overheated liver, soothing and calming it to prevent the organ from going into spasm. The yellow-to-orange pigment in mangoes feeds liver lobules and strengthens hepatocytes and Kupffer cells, allowing them to do the jobs they need to do. Mangoes also have a unique phytochemical compound that helps the liver’s immune system destroy the pockets of bacteria that create liver abscesses. Help prevent your liver from aging and cells from dying while improving bile production. Add all the ingredients to a blender and blend until smooth. Serve immediately. There’s nothing quite like a classic oatmeal raisin cookie–except maybe knowing it’s made only of clean ingredients! This recipe produces delicious cookies that will fill your kitchen with heavenly scent while baking. These cookies make a great addition to children’s lunchboxes or simply to have on hand when the craving strikes. Raisins can easily be ignored or forgotten, but they actually offer wonderful health benefits and in fact offer greater nutritional might than the goji berry, which is touted as a superfood. Raisins can vary in size and color depending on which type of grape is used. Grapes have a lengthy list of health benefits and can be particularly beneficial when it comes to battling The Unforgiving Four. They possess strong antiviral properties and can help in the removal of radiation from the body. They also work to remove DDT and toxic heavy metals from the liver thanks to the collaborative efforts of their amino acids and anthocyanins. Preheat oven to 350F. Line a baking sheet with parchment paper. Mix together the ground flax seeds and water to make the flax egg. Leave to soak for 15 minutes. In a medium-sized bowl, combine the oats, oat flour, coconut sugar, baking powder, baking soda, cinnamon and sea salt. Mix until uniform. In another bowl, whisk together the avocado oil, maple syrup, vanilla and flax egg. Add to the dry ingredients and stir until you get a uniform batter. Stir in the raisins. Using a large cookie scoop, scoop the mixture and drop onto the parchment paper. Flatten into round disks using a fork. Place in the oven and bake for 10-12 minutes, until slightly browned. Remove from the oven and cool. These mouthwatering Wild Blueberry Waffles are the perfect treat. Serve them up as a weekend breakfast for your children or tuck into them for an afternoon snack or even a fun dinner! Whenever you enjoy them, they’ll be sure to please. The star ingredient in this recipe is the wild blueberries. Wild blueberries contain dozens of undiscovered antioxidants, including anthocyanin varieties. There’s not just one pigment inside a wild blueberry; there are dozens of pigments not yet researched or studied. The wild blueberry is to the liver as mother’s milk is to a baby. 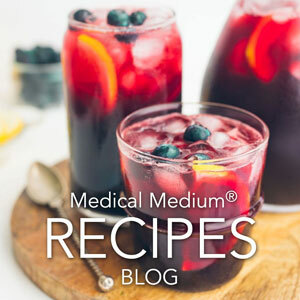 Not only do wild blueberries have the ability to grab on to plenty of troublemakers, they also hold on to them as they leave the liver, in a way that most other healing foods cannot. The pigments in wild blueberries have the ability to saturate deep into liver cells and cross cell walls and membranes inside the liver, spreading their blue everywhere. Wild blueberries enhance the intestinal tract, feeding good bacteria there, which benefits the liver greatly. To make the optional whipped cream, chill your mixing bowl in the freezer for 10 minutes. When the bowl is chilled, remove the thick cream from the top of the can, leaving the coconut water behind. Using an electric whisk, beat the cream for 2-3 minutes until you get soft peaks. Add the honey and beat for another 2 minutes. Set aside. To make the waffles, combine the oat flour and baking powder in a bowl. Whisk to combine. In another bowl, combine the apple sauce, almond milk, coconut sugar and vanilla. Mix well, then pour into the dry ingredients. Stir until you get a uniform batter. Add the frozen wild blueberries and gently fold them in. Make sure your waffle iron is hot. If it is not non-stick, spray it very lightly with avocado oil and remove the excess oil with paper towels. Ladle the batter onto the waffle iron and cook according to manufacturer's instructions. Repeat with rest of the batter. Serve with coconut whipped cream, fresh blueberries and maple syrup. Find out more undiscovered properties of healing foods and how they support you, check out my bestselling book, Liver Rescue. 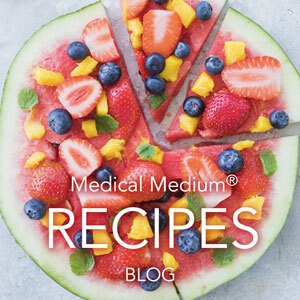 A creamy bowl of ice cream with medicinal benefits? That’s right. This delicious Chaga Ice Cream is made with a base of bananas and a dash of almond or coconut milk to make it creamy. With the addition of Chaga mushroom powder and warming spices of cinnamon and optional cardamom, you have a delicious and deeply healing ice cream you can enjoy for a meal, snack or dessert! Chaga mushroom strengthens the liver while reducing toxic liver heat when the liver is under stress and burdened from troublemakers. It also supports and strengthens the adrenals, which in turn assists in strengthening the liver, making it a more difficult environment for pathogens such as viruses and bacteria to survive in. The phytochemical compounds in chaga detoxify the liver in a steady, balanced manner. Place the bananas, coconut milk, chaga powder, cinnamon, cardamom and alcohol-free vanilla extract in a food processor and process until the mixture is smooth and creamy. Add a bit more milk if needed. Serve straight away, topped with chopped nuts, or place in the freezer for 1-2 hours for a firmer texture. These vibrant energy balls are bursting with nutrients, color and flavor, and they only take a few minutes to make. The wild blueberry powder is the star ingredient giving these energy balls their rich purple hue and elevating their nutrient value and healing properties. Try making a batch of these and storing them in the freezer so you can snack on one anytime you’d like or pop them into lunchboxes for school or work day fuel. Wild blueberries contain dozens of undiscovered antioxidants, including anthocyanin varieties. There’s not just one pigment inside a wild blueberry; there are dozens of pigments not yet researched or studied. The wild blueberry is to the liver as mother’s milk is to a baby. Not only do wild blueberries have the ability to grab on to plenty of troublemakers, they also hold on to them as they leave the liver, in a way that most other healing foods cannot. The pigments in wild blueberries have the ability to saturate deep into liver cells and cross cell walls and membranes inside the liver, spreading their blue everywhere. Wild blueberries enhance the intestinal tract, feeding good bacteria there, which benefits the liver greatly. Wild blueberry powder powerfully speeds up healthy liver cell production, cleansing, and regeneration. Place all the ingredients in a food processor and process until you get a uniform sticky mixture. Using a tablespoon measure, scoop out portions of the mixture and roll them into balls. Repeat with rest of the mixture. Looking for a sweet treat? It’s hard to beat this delicious, moist, flavor-packed Wild Blueberry Banana Bread. It’s perfect for an afternoon snack with a cup of your favorite herbal tea, or enjoy it after dinner for dessert. This recipe is not only gluten-free and dairy free; it’s also low in fat, especially if you skip the optional walnuts on top. You can make enough to freeze leftovers that you can store in individual slices in the freezer. Then when you want to enjoy a slice, simply let it defrost, heat it up in the oven and enjoy! Two of the star ingredients in this recipe are the wild blueberries and bananas. 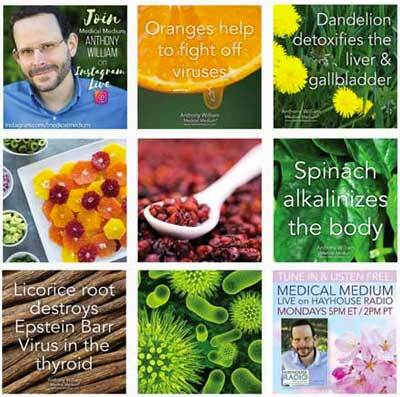 Below is an excerpt from Liver Rescue that showcases just some of their healing properties. Preheat oven to 350F. Line a 9x5 loaf pan with parchment paper. Place the bananas in a bowl and mash with a fork. Add the maple syrup, coconut sugar, vanilla extract and almond milk. Mix well. In another bowl, combine the oat flour, sea salt, baking powder and baking soda. Whisk until lump free. Add the wet ingredients and fold gently until you get a uniform batter. Add the blueberries and stir very gently, just enough to incorporate them. Pour the batter into the loaf pan and bake in the oven for 40 minutes. After this, turn the oven off but leave the banana bread in the oven for 10 more minutes. Remove from the oven and cool completely before slicing.